Whispers in the Loggia: "The Gospel Cannot Thrive in Pride": At the Synod, The Floor Calls for "Penance"
"The Gospel Cannot Thrive in Pride": At the Synod, The Floor Calls for "Penance"
On its second working day, the Synod for the New Evangelization turned its ear to the floor, as yesterday's tone-setting presentations from the dais gave way to the five-minute interventions by the delegates beyond. Notably for this crowd, several of the English-speaking church's heavy hitters weighed in with their takes during the morning session, led by Archbishop José Gomez of Los Angeles, who pointed to the impact of globalization as a "challenge" for the church, one which "requires the church to protect immigrant populations from being marginalized and exploited." The head of the US bishops' migration efforts – as well as the largest diocese American Catholicism has ever known – it's notable that Gomez was appointed to the Synod by Pope Benedict last month only after the LA prelate reportedly declined a place on the ballot for one of the USCCB's allotted four seats. 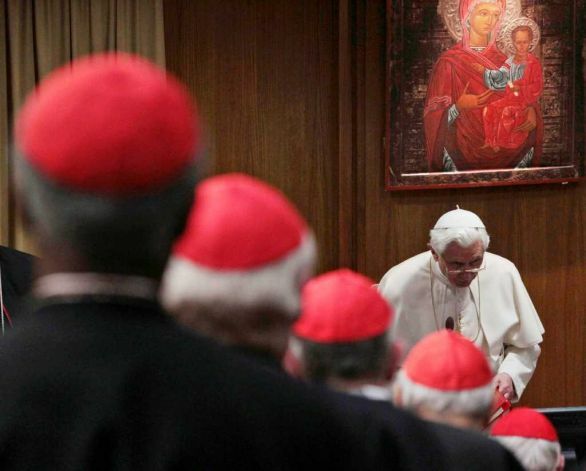 In that light, the pontiff's apparent determination to have Gomez in the room can be seen signaling two things: first, further evidence that – as Hispanics draw ever closer to comprising a majority of the nation's 70 million Catholics – Benedict places a considerably higher premium on the community's presence and voice than many natives remain to imitate (the Angeleno's successor in San Antonio, Archbishop Gustavo García-Siller, is likewise present as an elected US rep.); and, second, given Gomez's standing as "Archbishop of Hollywood," perhaps a nod to what the world of entertainment could teach the church's proclamation of the Gospel. Back to the former point, however, it's telling that of this Synod's delegation of six American bishops – four elected, two appointed – only two (the Relator-General, Cardinal Donald Wuerl of Washington, and Archbishop Joseph Kurtz of Louisville, the USCCB vice-president) come from dioceses whose Catholic populations don't have either a Hispanic majority or one just shy of it. As Latinos currently comprise no less than 60 percent of Stateside Catholics younger than 30 – while, from another angle, national data released this morning reports that one in five American adults (and fully one in three under 30) now holds no religious affiliation whatsoever – this has been your "Demography is Destiny" Moment of the Day. 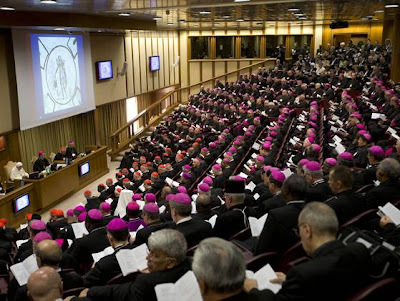 In the other domestic turns on the floor, making his first Synod speech, the USCCB president, Cardinal Timothy Dolan of New York, quoted Fulton Sheen and GK Chesterton in calling for a greater emphasis on sacramental confession, which he termed "the primary sacrament of the New Evangelization." "The sacrament of reconciliation evangelizes the evangelizers," Dolan said, noting that while "the second Vatican Council called for a renewal of the sacrament of penance... what we got instead, sadly, in many places, was [its] disappearance." For his intervention, Kurtz (who's blogging daily from Rome) focused on the recent introduction of a liturgical Blessing of the Child in the Womb – a project he championed – as "a pastoral moment of first evangelization of the child and new evangelization of the family," while Kicanas honed in on how the church's "acts of love and justice" serve as "a prophetic evangelical call," noting that "sharing and acting on our Catholic social teaching often bring people to Christ." As a Missionary of the Holy Spirit, meanwhile, the energetic, emphatic, Mexican-born García-Siller – soon to be 56, the nation's youngest metropolitan, and the lone US prelate who bears his episcopal motto in Spanglish – hewed to his community's charism by imploring a "new Pentecost," asking the Synod to call for the Pope "to consecrate the world to the Holy Spirit." Given the backdrop of the church's decline across much of the West in the face of scandals, atrophy, and perceptions of institutional coldness or arrogance, however, perhaps this Tuesday's most potent messages came instead from the East, courtesy of two even younger archbishops from the Philippines: Luis Antonio Tagle, the 55 year-old "golden child" named to Manila – with 3 million members, Asia's largest diocese – last year by Benedict, and Socrates Villegas, a protege of the iconic Cardinal Jaime Sin who was given the mitre at 40, then a pallium eight years later. His own archdiocese of Lingayen-Dagupan (100 miles north of the capital) numbering more than a million Catholics, Villegas turned 52 late last month. With some 75 million faithful, the Filipino church is even larger than its US counterpart, and considerably more influential on the national stage. Yet while the prior generation of its leadership literally led the revolution that overthrew a government, its heirs have apparently come to a rather different sense of their mission. A young girl asked: “Are we the youth lost or has the Church lost us?” Her question expresses a longing for a Church where she can be found by Jesus and where she can find Him. But for the Church to be the “space” of a faith-encounter with the Lord, she [i.e. the church] must learn anew from Jesus in whom we meet God. The seemingly indifferent and aimless societies of our time are earnestly looking for God. The Church's humility, respectfulness and silence might reveal more clearly the face of God in Jesus. The world takes delight in a simple witness to Jesus, meek and humble of heart. To be sure, a similar thread was taken up by an American prelate at the Synod – just the one that took place 15 years ago. While the interventions continue through this afternoon and tomorrow, the Synod's business will halt on Thursday morning for this week's second outdoor liturgy in St Peter's Square: the Mass at which the Pope and Synod Fathers will mark the 50th anniversary of the opening of Vatican II, launching the church's 13-month Year of Faith. In a poignant nod to the milestone, no less than a dozen of the 69 surviving Council Fathers will be on hand to concelebrate. Set to begin at 10am Rome time (4am Eastern), the Thursday rite's worship aid is posted.